Gang member may be connected to security guard shooting, Kaitlin McCulley reports. GALVESTON, Texas (KTRK) -- As hotel guests fill up the back parking lot of the San Luis Resort Thursday afternoon, the Molis family cannot escape what happened there the night of April 9. 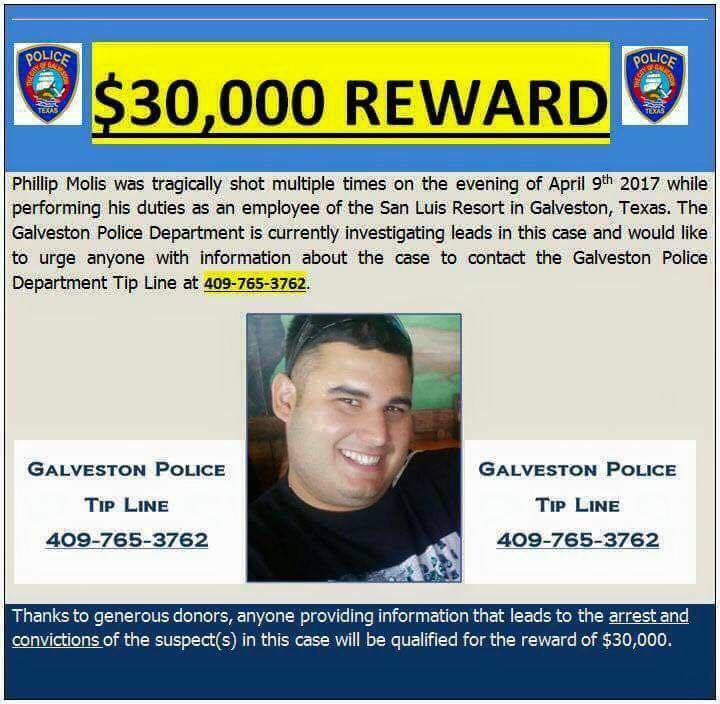 Phillip Molis, a 23-year-old security guard, was shot multiple times after spotting three men behaving suspiciously. Molis' aunt, Stephanie Molis-Gutierrez, said her nephew is fighting to survive. "Seeing brother who has always been so full of life and always on the go, now confined to a hospital bed with tubes running throughout his body and fighting for his life everyday, has truly broken us," Molis-Gutierrez said. Security guard survives being shot at hotel, Steven Romo reports. Lt. Bushek with the Randall County Sheriff's Office near Amarillo, was attending a conference at the San Luis Resort when he heard gunshots and ran to help. He is credited with saving Molis' life. Police found 21-year-old Tyronne Haynes Davis hiding near the scene of the shooting April 9. He was arrested on an unrelated charge and is in custody. "After a thorough search of the crime scene and the surrounding parking lot, Galveston PD investigators were able to locate over 10 vehicles that were burglarized before someone called in to report it," Lt. Joshua Schirard said. Investigators said Davis is a member of a gang based in the Missouri City area, called Gorilla Mob 187. They are still looking for two other men they believe were involved in the shooting. Molis' sister, Destiny Molis-Rojas, asked the public to call police with any information related to the case. "You know, this can save other people," Molis-Rojas said. "He's very loved and very well-hearted person. It's hard to see him the way he is. We need justice for it, so don't be scared to talk." There is a $30,000 reward for information leading to the arrest of others involved in the shooting. Anyone with information is asked to call the Galveston Police Department at 409-765-3762 or CrimeStoppers at 409-763-8477.